Interested in radial training? 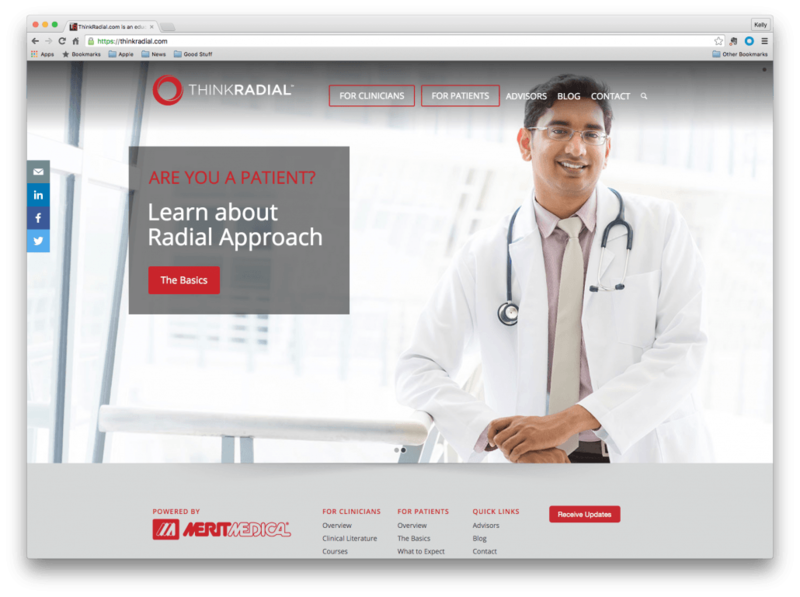 Visit ThinkRadial.com, powered by Merit Medical – a radial education tool for Interventional Cardiologists, Radiologists and Vascular Surgeons. View an extensive clinical literature library, learn about upcoming Events or Pre-Register for a radial training course. Explore our extensive portfolio of radial products – from set-up and access to hemostasis – we can help provide the right tools to streamline your radial procedures. Prepare and protect your patients efficiently and safely with radial arm boards, accessories and drapes. Achieve quick and effective access with needles and sheath introducers specifically designed to access the radial artery. Our full line of diagnostic catheters and wires include radial shapes and sizes designed for cardiac and peripheral interventions. Interventional tools designed for radial access for accurate stent positioning, advanced guiding catheters and inflation devices. Provide patent hemostasis with Merit’s comfortable, convenient compression devices. The radial approach requires integrated procedure packs and trays that anticipate and optimize your workflow. Merit Medical can help.